I found the service from tradescanners fantastic! They dealt with my querie quickly and professionaly. The assistance given to me along with the installation was extremely helpful and I would recommend tradescanners! Excellent product and fantastic service from Tradescanners. Highl;y recommended. Compact design - The SP-1120 is compact in size, so it can be used at the desk or at reception where space is limited. Even with its compact size, it is equipped with a brake roller to accurately separate each page, and an ultra-sonic sensor to accurately detect multifeed, so the user can scan without worrying about potential problems. 20 ppm scanning speed model - The SP-1120 helps users finish scanning tasks in a short time without stress, with its 20 ppm (A4 color, duplex 200 / 300 dpi) performance. 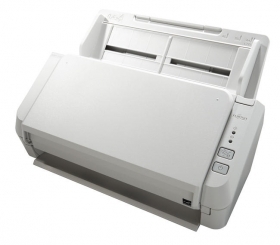 The automatic document feeder (ADF) holds up to 50 sheets at a time, and the scanning speed is maintained even at 300 dpi. Support plastic card scanning - The SP-1120 is able to handle various documents from thin to thick paper (50-209 gms), as well as plastic cards for various tasks and applications. In the case of over-the-counter services, application forms and plastic ID cards can be scanned at the same time to avoid customers waiting. The simple and easy-to-use design can minimize the scanning procedures and reduce human-error. The SP-1120 has a simple operation panel with only 2 buttons (Scan / Stop and Power), and after presetting the bundled Presto! PageManager, only one push of the scan button is necessary to store document image data instantly.